It is night. The ground is metal. Shiny mack truck is leaning 3 degrees to the back. 2 red lights are 1 inch over the mack truck. 2 red lights are 150 feet to the left of the mack truck. 2 cyan lights are 2 inches over the mack truck. 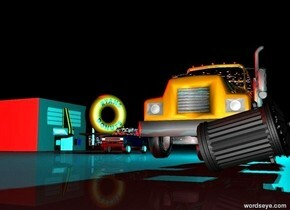 2 cyan lights are 20 feet behind the mack truck. The donut shop is 100 feet behind the mack truck. The donut shop is 70 feet to the left of the mack truck. The movie theater is 70 feet behind the mack truck. The movie theater is 90 feet to the left of the mack truck. It is facing to the right. The bronco is 30 feet behind the mack truck. It is 30 feet to the left of the mack truck. Large garbage can is in front of the mack truck. It is 36 feet to the right of the bronco. It is leaning 75 degrees to the left.